Health Benefits of Eggplant: The eggplant also known as aubergine, brinjal, guinea squash, garden egg and melongene, is usually distinguishable by its structural egg-like shape and vibrant purple color. Eggplant benefits in a way it is very good source of dietary fiber, vitamin B1, and copper. It is a good source of manganese, vitamin B6, niacin, potassium, folate, and vitamin K. Eggplant also contains phytonutrients such as nasunin and chlorogenic acid. 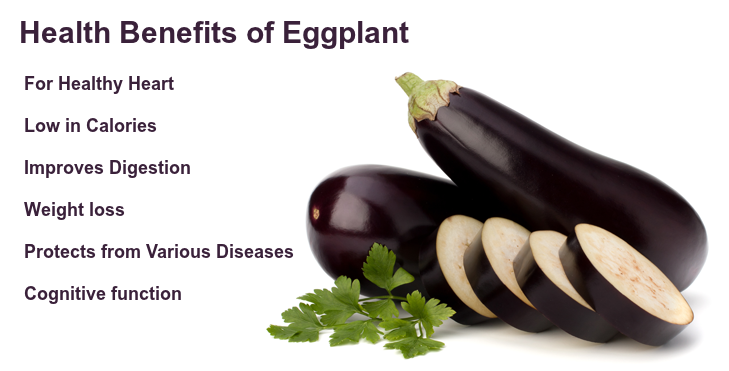 Let’s see amazing health benefits of eggplant here on this page. Health Benefits of Eggplant: There are several varieties of eggplants grown and available all around the world. They vary greatly in shape, size, and color depending upon the cultivar type. Generally, aubergines fall into two wide categories, either oval shaped, or thin and elongated. It is commonly called the “king of vegetables”, at least in India, as it is one of the most versatile and functional foods in the cultural gamut. Ayurveda strictly advises the limit of Eggplant consumption. Brinjal or eggplants contain large amounts of phytohormones and these help in treating premenstrual syndrome and amenorrhea. There brinjal works as diuretics. It can stimulate menstruation when consumed daily which is not a good option for a pregnant lady. This is one of the main reason to avoid Brinjal during pregnancy. if you eat eggplant daily while you are expecting, then it may induce labor and lead to miscarriage. 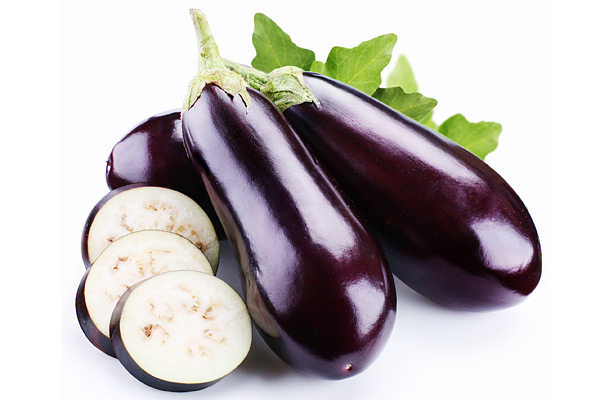 Eggplants or brinjals are enriched with menstruation-inducing properties. Due to these properties, brinjals may also lead to abortion. These are also not good as they may cause acidity problems, therefore it is suggested that women should avoid eating brinjal during pregnancy. Consuming undercooked brinjal can cause digestive problems that can prove harmful to your pregnancy. Eggplant contains fiber, potassium, vitamin C, vitamin B-6, and phytonutrient which supports heart health and lowers heart-related diseases. As per the American Journal of Clinical Nutrition, if we eat foods containing flavonoids it results in lowering risk of mortality with heart disease. Consuming even small quantities of flavonoid-rich foods benefits your heart health. Eggplants are great sources for dietary fiber which act as a strong element in any balanced diet. Fiber is essential for gastrointestinal health, as well as for the regular movement of the bowels. Fiber bulks up your bowel movements so they pass more easily through the digestive tract, while also stimulating peristaltic motion, the contraction of the smooth muscles that move food through the body. As eggplants is a low-calorie food and contain almost no fat or cholesterol, it is one of the best healthy food for people need to reduce weight. It is also a great source of dietary fiber which acts as a strong element in any balanced diet. The fiber content is also very filling, which inhibits the release of ghrelin, the hormone which tells our mind that we are hungry again. Eggplant skin is a powerful antioxidant that protects the lipids comprising cell membranes in brain cells from free radical damage. It has also been proven to help facilitate the transport of nutrients into the cell and wastes out.